The situation of press photography considerably changed in the 1960’s when televi-sion firmly entered the territory of showing actual events. Directly covering the murder of US president J.F. Kennedy in Dallas, Texas, in 1963, seen by billions of spectators worlwide, the TV medium announced a new age of mass distribution of images that, among other things, also redefined the role and content of classic visual practices. When Andy Warhol in 1962 introduced into the field of painting and printmaking the mechanical means of re-production that formally denied the notion of »artist’s handwriting« while often using the pre-existing reproductions of photographic images from the press as subjects, the work of art and the mass media picture became practically equal. The press photograph is not only a document, testimony, information and evidence...but much more, because showing the stills from reality is only it’s empirical aspect - it is, in fact, determinated by numerous factors (economic, aesthetic and ethical) that con-dition it’s production as well as by ideological, commercial and practical demands that regulate it’s distribution. That is why the nature of these photographs is double, in fact, contradictory, because on one side, they show or reveal the real ongoing in certain spatial and temporal context, while on the other side, they already interpret it, show it from a very specific (personal, moral, critical...) point of view. To transform the real into image, one has to take from it a certain frame and restrucurate it into a category of symbolic order that can also function withoud the related text. Unfortunately, the ability of »reading the images« is nowadays nearly a privilege of the happy few while the consumering crowds in most cases limit themselves to ephemeral registration of what they see, the critical reconsideration of visual messages remaining out of reach for their notion of percepting the real. The surplus value of the press photography comes exactly from transgressing the bare document, through the distance established by reflected articulation of the chosen subject on both, formal and intentional, levels. In final consequence, the photographic »covering of the real« is also an individual creative act comparable and not at all of minor value to that of the creative approach to any other subject or theme within the production of images - no matter which media, techniques and technologies are being used in this production. In other words, passing from the territory of the real on the horizons of the possible within which the aesthetic realizes itself, seems selfunderstood - as the space dedicated to photography by (printed) media is extremly modest and besides that, conditioned by many editing conventions so that more ambitious photographers can show their work mostly in exhibitions and may be in specialized magazines or monographs, if they find a publisher, of course. When an attractive daily event such as those in battle-fields or covering the consequences of terrorist acts or documenting the damage caused by natural catastrophies, is not the case, there is very little probability that a good press photograph will be seen in the front page of a newspaper or magazine. The editorial policy directing and selecting what to publish, namely moves photography from where it should be seen according to it’s nature, and places it, in fact, into the field of those discoursive practices which are not oriented any more towards »covering the real«, but first and almost - towards articulation of the photographer’s understanding of what he or she sees. The paradox we encounter in constantly changing circumstances of technological progress and it’s influence on everyday’s way of living lies right in the fact that humans accept the changed reality much slower than one would expect while listening to the prophecies of the most enthusiastic promoters of the visual communications (and other) technologies. As things are becoming apparently more simple and affordable to nearly everyone we face such absurds that anybody who holds a photo or video camera, consid-ers him/herself an artist - and this illusive pretention is quite frequently abused by some curators and museum directors who widely open the doors of their institutions to this kind of manipulators and self-called “«creative professionals«. To have a clear position and to choose the evaluation of an artwork in relation to it’s quality often means swim-ming against the stream so that one who is not on the »cutting edge« also takes the risk of being excommunicated or at least in forced conflict with the defenders of the estab-lished »contemporarity«. In the present selection of photographers and their works we concentrated exactly on this - on conscious and deliberate preference for personal views transforming the chosen fragments of the real into series of individually constructed frames, each of them having it’s »before« and it’s »after« so that what we actually see is in fact an autonomous visual entity within which every single artist demands him/herself (and, of course, trying to find the answers) with the language of photography how to identify the real beyond the image as close as possible to the represented. In this sense, Jaka Adamič with his series of photographs taken on the streets and based on sharp contrasts of light and shades (sometimes also using reflections that double certain parts of the shots and so opening the question of image within the image as multiplied illusion) reveals the difference between material (buildings, objects, humans, animals, plants...) and immaterial (their shadows or reflections) as meaning and message. The nature of photographic representation opens the possibility to join both aspects of perception in a new entity in which the material is reduced to it’s flat simulation that is - as formal value - equal to ther images of shadows and reflections being themselves considered as categories of flatness par excellence. The subject as such becomes irrelevant (even if the »narrative« included in pictures may have other significative conotations which are absolutely legitimate, too), the structural variations of Adamič’s photographs are directed towards the self-reflective dimension of the medium which, while autorealizing itself through the reality in front of the camera, at the same time is being conscious that it will create a new reality which didn’t exist before the shot was taken. Thus, we can say in this case that the conviction how photography covers the real is wrong because the photograph as image first of all shows itself. The exhibited works of Jure Eržen in their form and content belong to different field of perceptions and meanings. The photographer who gained his high reputation with shots from actual war zones is presented here with a series of photos from »the backstage« - also being a constant of his work for the press - of military actions and their consequenc-es. 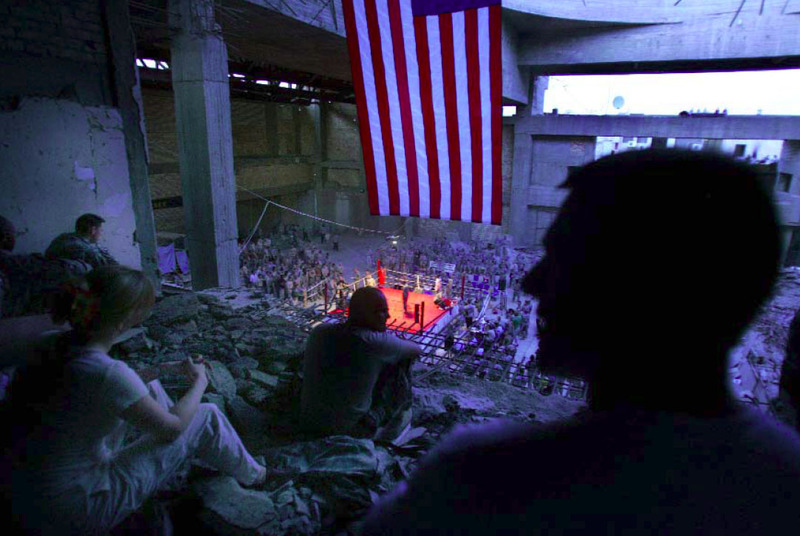 The scenes of the boxing competition in one of the US Army units in Iraq concentrate on specific atmosphere generated by the precise conceptual approach and visually ef-fective use of the expressive means of color photography. The interior where the event takes place is, of course, not a sports hall but an abandoned, filthy building adapted ad hoc for putting on the ring and seats for spectators. It is obvious that the photographer was not primarily interested in sport or boxing matches as such (although they are part of the series) but he dedicated his attention mostly to the action around, among the visi-tors, revealing many meaningful details that determinate the ambiance and context of the event itself. Eržen’s mastery of color photography which, when intended to be used for press, in most cases easily sinks into cheap pleasebility (in the National Geographic style! ), is confirmed again and again in every picture taken, on the level of generating formal structures, color contrasts in composition dynamics that create tension and par-ticular meaning allusions. 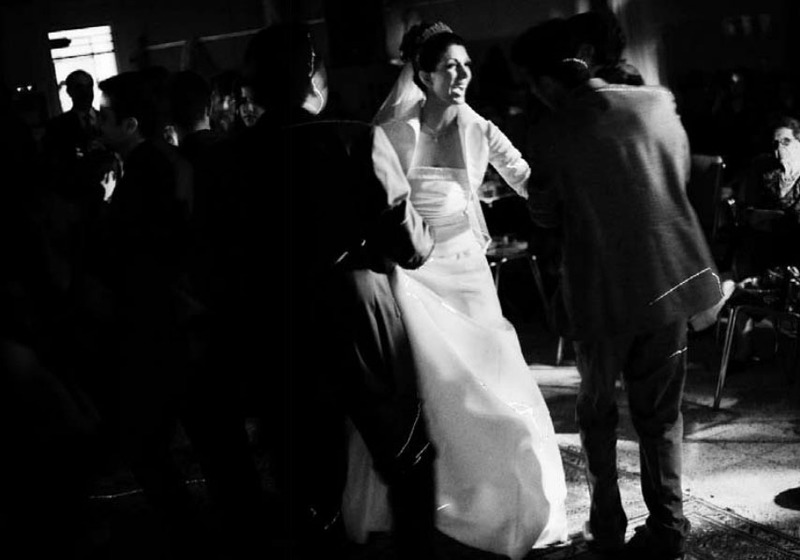 What characterizes Manca Juvan’s photo-essays is their consistency and style harmo-nization which are fully evident also in the present series of shots from the life of Iranian youth. In the country where two thirds of inhabitants are under 35 years old, the conflict of interests between the dogmatic demands of the rulling islamic hierarchy and wishes, expectations and needs of growing young people is more than evident. The level of toler-ance still admitted by governing power is certainly not very high but it seems that the con-trasts represented in photographs taken in an environment of supervised freedom show a kind of pragmatic convivance between (religious) tradition and modernity opposing this tradition. Juvan is not interested only in documenting this duality but she is able to create an efficient message from the story the essence of which is beyond the seen and shown. In a certain sense, her understanding of press photography - in this particular series - is quite the opposite to that of Adamič: where the latter turns inside, into meta-language, Manca Juvan tries to question the real behind the reality of representation. But one should not ignore that in her case also, we have to face a perfectly elaborated, sug-gestive photographic language supported by personal poetics of the artist and her sensi-bility to establish sensual and emotional relationships between photographed facts and those to whom the photos are dedicated to be seen. Jože Suhadolnik is well known for his large photographic production in various icono-graphic themes from portrait to press shots and in all his subjects we discover concen-tration on individual as the main generator of complex changes in contemporary society - since his first representations of the so-called »Ljubljana alternative scene« to his ac-tual position of an experienced interpreter of key events in nowadays social and political reality. In a similar way that Manca Juvan but with different signification note and within another stylistic paradigm, Suhadolnik shows his Mornings in Russia through a spec-trum of human characters and environmental fragments, in alternation of fullness and emptiness, shown and suggested, evidence of facts and mistery of intimate stories. Eve-ryday’s repeating event such as the birth of the day in the morning, is only a nonpreten-tious framework within which the destinies that people can or cannot influence are being interlaced. Behind the perceived reality there is always another reality which we more suppose than know, and photography can only suggest it - so more successfuly when the photographer’s identification with the object and content of the photographed is stronger. Suhadolnik masters this identification in his visual adressing through the lens and articulates it with contrast representational structures that simultaneously »trans-late« the empirical into imaginary, constructed reality.